The three of us have just arrived home after a week with my family in Tel Aviv, Israel. It was inspiring in so many ways but we’ll talk more about that in a later post (and share some recipes from the trip). The most wonderful thing was however to focus on and spend time with our daughter without being occupied by book editing or any other work. This spring has been quite intense so now we try to savour every moment with Elsa before her little brother arrives. As some of you might have seen on Instagram, the Israeli food scene was right down our lane. We hardly missed anything from home. 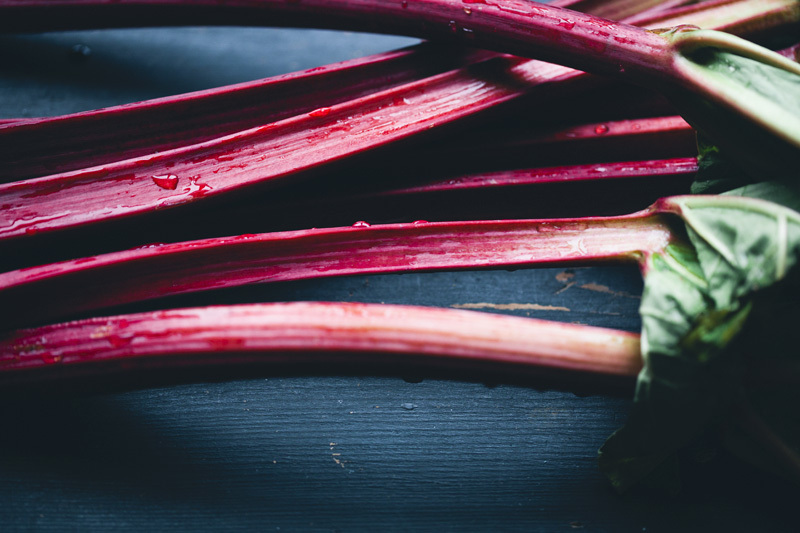 Apart from the one thing that Luise has started craving lately – Rhubarb. Apparently they aren’t very easy to come by in the Middle East. Luise has done this quinoa crumble for us a few times since the first organic rhubarbs popped up this year and it was the first thing she baked after we had landed. 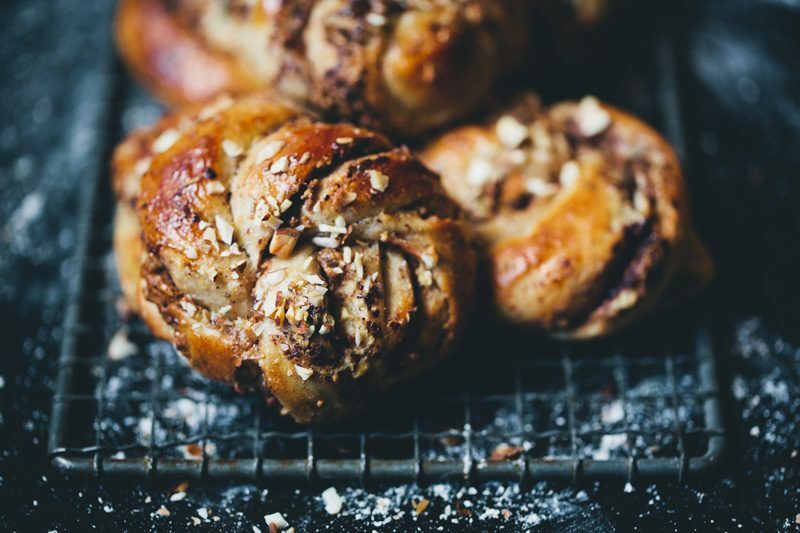 It is as lip smacking as it is simple (and vegan and gluten free). 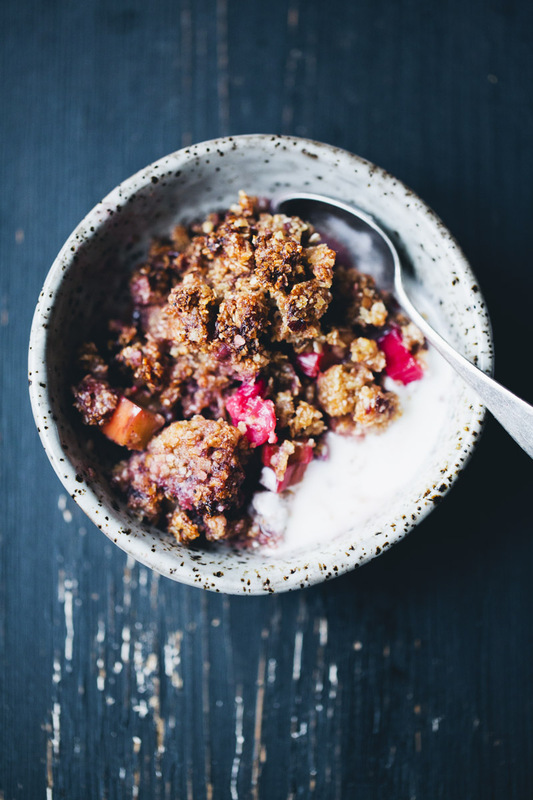 Quinoa flakes are a bit sturdier than oats and add a nice crunch to the otherwise very sweet crumble. 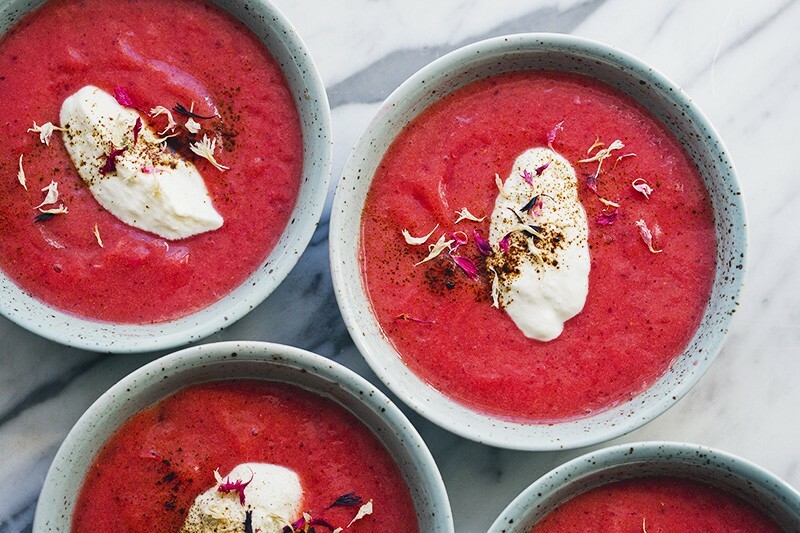 Raw rhubarb has a very distinct tart flavour, but when baked together with apple and strawberries it all comes together into a well balanced and naturally sweetened delicious mess. Hardly anything needs to be added, but if you wanna balance some ice cream on top, we’re not gonna stop you. Let’s get ready to crumble! 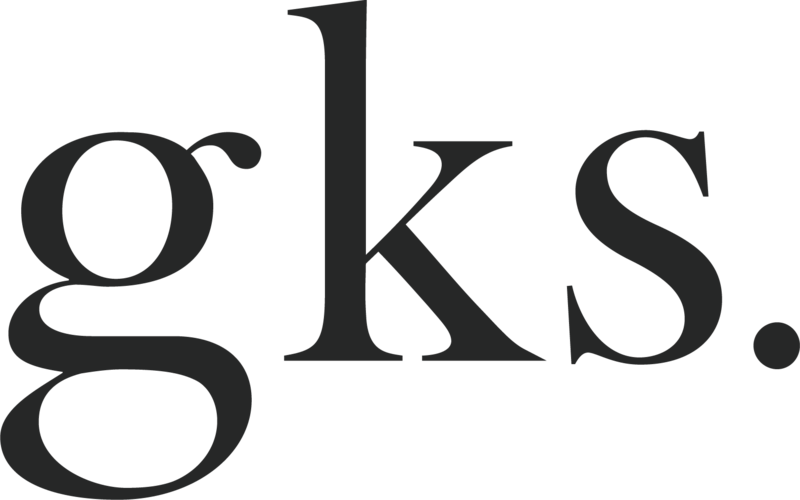 We also wanted to thank you for your wonderful respons on our new YouTube channel! It was a pretty scary thing to launch, especially since we speak in the films. We have just posted another video with one of our favorite breakfast recipes from the blog; Raw Buckwheat Porridge. And we have one of Elsa’s favorite dinners coming up in just a few days. It’s something I believe all you parents will appreciate! If you haven’t already subscribed on the channel, you can do so here. Preheat the oven to 175°C / 350°F. Grease a 22 cm / 9 inch baking dish or pie tin with coconut oil. Rinse all fruit. Slice the rhubarbs, halve the strawberries if necessary and dice the apples (discard the seeds). Place in a baking dish and toss with vanilla, orange juice and honey. Prepare the crumble in a separate bowl. Start by thoroughly mixing quinoa flakes, buckwheat flakes and salt. Chop the dates and add to the mixed flakes together with the coconut oil. Use your hands to mix until large crumbs are formed. Pour the crumble filling evenly over the fruit. 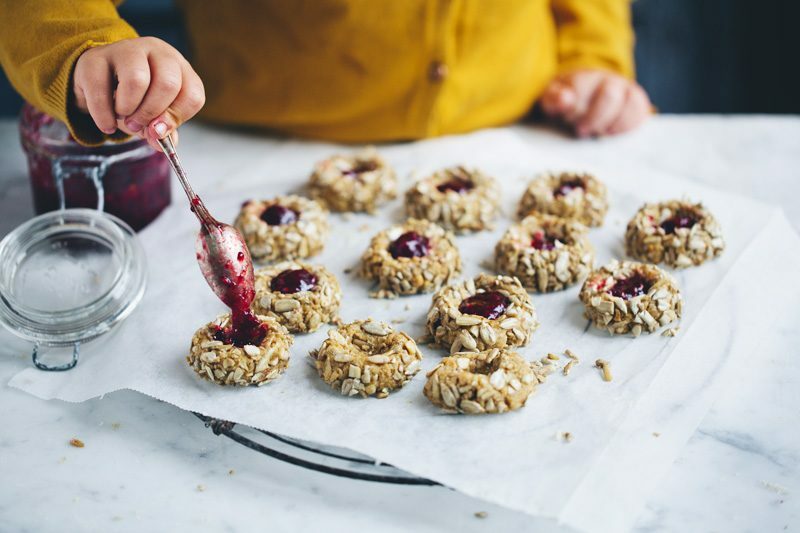 Bake in the oven for 30 minutes until the fruit juices are bubbling around the edges and the crumble is firm and browned. Oh, yummmm. This looks amazing. This looks a lot like a dish I made and posted on Instagram using Almond Meal. It was ridiculously tasty, so I'll definitely have to try yours as well. I pretty much LOVE anything Strawberry Rhubarb. It's about too get cold here in Sydney soon, the ocean is cooling but with this little Jem of a desert I feel well prepared for winter. Thankyou for all your beautiful recipes :) Love & light too yars! OMG- This sounds amazing. Can't wait to make it. Thank you. 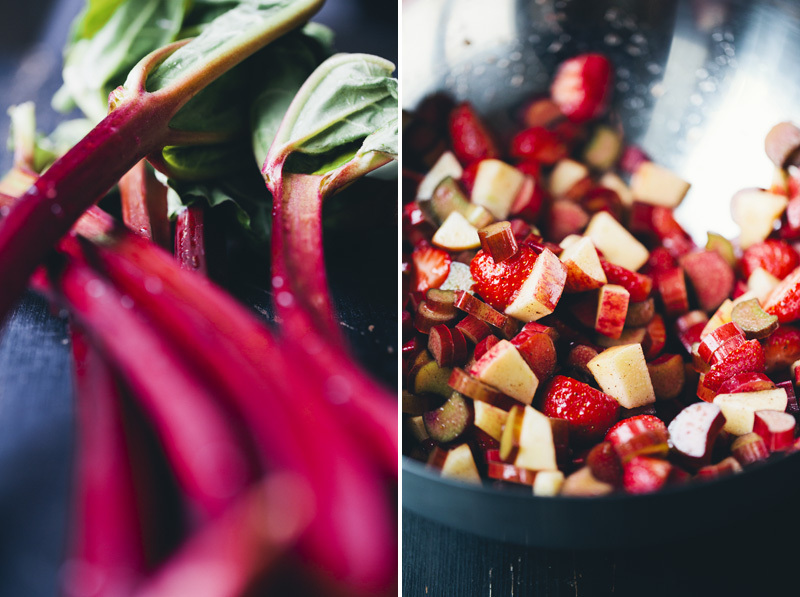 I've been rhubarb crazy lately too, and have been making an oaty all-rhubarb riff of this for the last couple weeks, maybe this'll be tomorrows breakfast. I am reading your post from Tel Aviv! I am here with my family for a wedding. Just had the most amazing food experience here and can't wait to read your recipes from here. 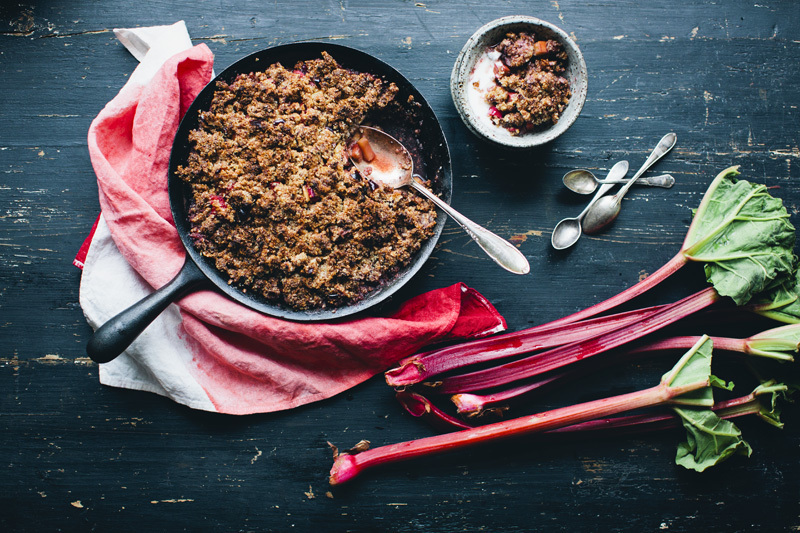 By the by the rhubarb crumble looks amazing! Excited to try when we return home later this week. Oh, yeeess - the simple beauty of rhubarb, love it! Never have been to Tel Aviv or Israel before so I can't wait to see your photos and read the recipes! The ones from instagram already left me intrigued ;-). 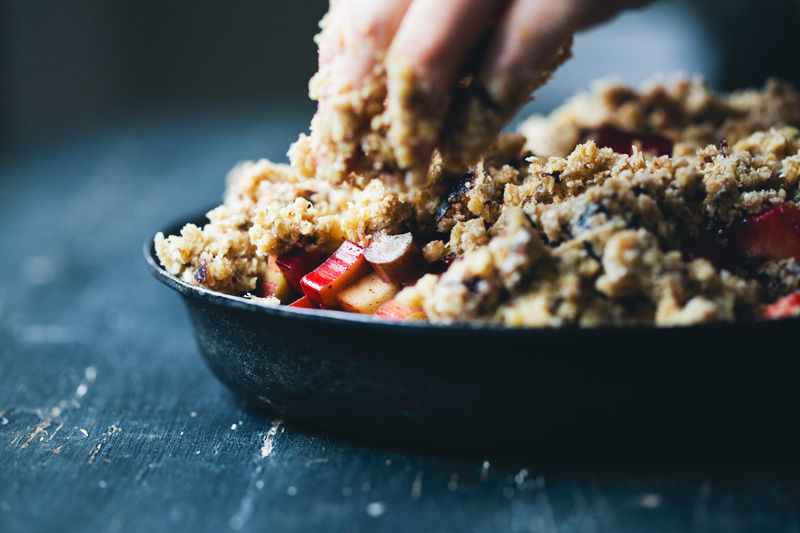 But back to the crumble - I love the idea of usin Quinoa flakes in it, even if I might need to try it out with oats, 'cause it's hard to get a hand on them here. Nevertheless, as always, thanks for sharin! Now I'm off to check out your youtube! Till now I baked this rhubarb season most of the time gluten free rhubarb pie with buckwheat (the recipe is also on my blog). But next time I will definitley try out your rhubarb-strawberry-crumble. It sounds very delicious!! Wow it looks really amazing! English is not my native language so one thing is not clear for me. The quinoa is cooked already when you make the crumbles? Or this quinoa flakes is really like a flake and than it makes more sense to me why you don't mention cooking it. :) I've never seen quinoa flakes before! Thank you and thanks for this fantastic dish! hi, I'm new to Sweden where do you go to find all these ingreidents like quinoa and buckwheat flakes ? I'd love to try your rhubarb and strawberry crumble. Rhubarb & strawberry, what a delightful combination! I am sure the smell must have been enticing while the quinoa crumble was baking in the oven!! I enjoyed your last video too, such an artistic imagery with the perfect soundtrack. Bravo! I flipping love rhubarb, especially when paired with strawberries. The crumble topping is the icing on the cake! I may have to get over my fear of rhubarb for this one. http://thatumamilife.wordpress.com - a clean eating bento blog. Japanese or Asian-inspired. Holy smokes, this looks flipping awesome! 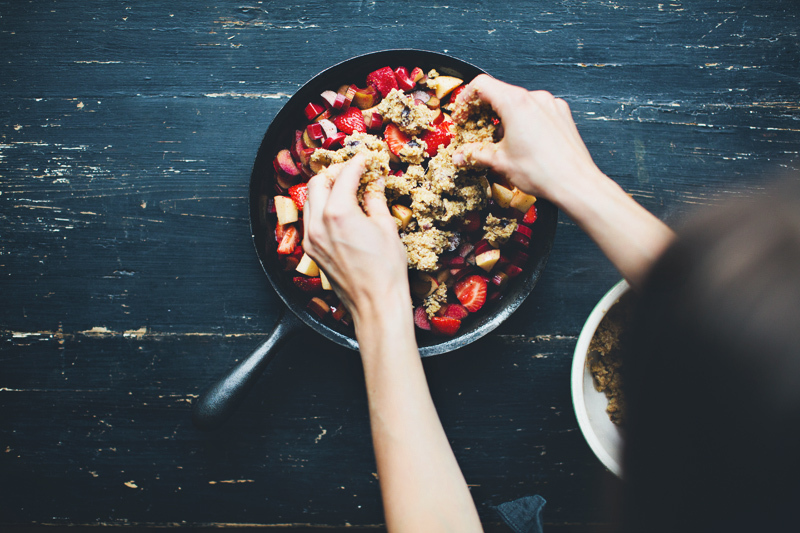 Love that quinoa crumble! Love it! I've never thought of using quinoa in a crumble, great idea! And the photos...gorgeous! Oh this looks delicious, looking forward to giving it a go! Rhubarb is a favourite of mine! Wendy @ Moral Fibres - where sustainable living is hip, not hippie. mmm that looks delish! 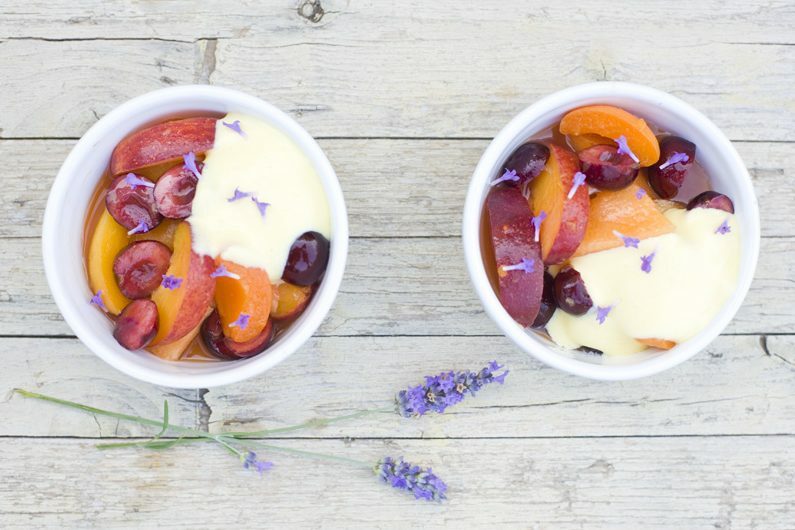 love the use of quinoa, it sounds like it would be delicious in this dessert.